Yin and Yang symbol are well known to most people here, but how about observing the Yin-Yang influence in the past/myth and present? To that end, one can identify either Yin with evil and Yang with good or vice-versa. In middle of evil, there will exist an island of good...and in middle of good, there will exist an island of evil. A case in point being from history/mythology...In Ravan's evil kingdom there was an island of good by name of Vibhishan...and in Dashrath/Ram's good kingdom there was island of evil by name of Manthra/washerman..
Is this thread supposed to be funny? If yes, please let me know and I will (try to) step out. Just yesterday a good friend of mine was telling me how its beneficial to get the negative weeds out of my life/character. I am really thinking of starting it right away. Join me Dhuru i kicking the yin out of our lives? Last edited by Rakhi; January 17th, 2014 at 05:37 AM. Is this thread supposed to be funny? If yes, please let me know and I will (try to) step out. Just yesterday a good friend of mine was telling me how its beneficial to get the negative weeds out of my life/character. I am really thinking of starting it right away. Join me Dhuru i kicking the yang out of our lives? So ... Yang = positive, active, logical, hot and "hard" men all day. Why would you want to kick that out? jeez .. theres no pleasing some women, I'm telling ya! Oh darn! I meant kick the negative out!! Yin(g) Yang model of life/universe/Tao states that opposites co-exist. At best you can determine how small the island of good will be in ocean of evil or how small the island of evil will be in ocean of good. Yes, I am aware of the model. I know they co-exist. However, to have the perfect harmony in life, it is I who should know how much Yin exists in my life. Knowingly or unknowingly, most of us do accommodate more of Yin than what you really must have. I for one know I can do better. yes, identifying Yin would be the first and the most important step but not the last. And then what next? Weed out what is not needed. makes sense? if you weed out negatives from positives, you will end up weeding out positives from your negatives. Nah, that cant be it. Not for me at least. Lets take an example. Say, I want to face a certain problem, I should be able to face it without making excuses why I cant face it. How can that take a positive out of me? Like i said, maybe we both work differently. negative and positive should co-exist, true. But at right proportions. off oh.. why getting seriouer and seriouser..
little boy spotted some thing new.. eggsplain it pyaar se..
beta.. cvi niche jo rubber tube jaisa latak riyaa hai naa vo ying hai.. asal mein us par laat maarne se ting kaaawaaz hotaa hai provided you have balls of steel.. vo misspell ho gayaa galti se. Kahin kahin us ko ying ke badle ling bolte hain.. us ke baaju mein chotaa saa gol sa ek hai naa vo yang hai.. us par laath maro to Tang kaa awaaz hona chahiye.. par kabhi kabhi luch luch models mein laat maro to keechad me pattahr phekne mafik aawaaz karta hai. Vaise chinta mat kar.. tu jab badaa ho jaayenga naa tab khud hi samajh jaayega. Ok.. chalo ab doctor doctor khelne jaao. Who decides whether proportion is right or wrong? Last edited by dhurandhar; January 17th, 2014 at 04:56 PM. We decide. You will decide for yourself and I will decide for myself. Done? Come on, I need someone to give me company. My good friend is miles ahead. She will not be able to join me. What is Ying Yang ? How does Ying Yang affect our lives ? How can we make best use of Ying Yang ? Where did the concept of Ying Yang originate ? Is Ying Yang Chinese or Japanese ? 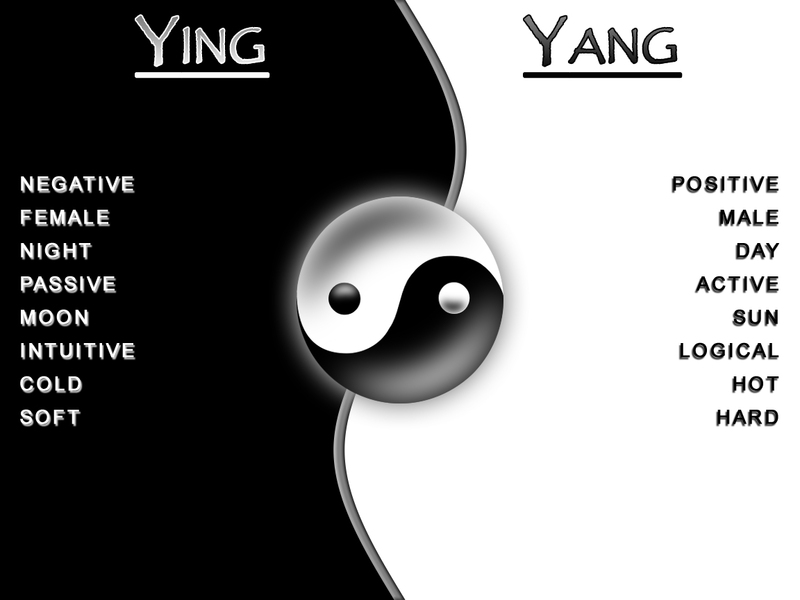 What are the benefits of Ying Yang ? Ying Yang is a symbolic representation of universal duality (female-male, negative positive etc)....it is supposedly of ancient Chinese culture (before Confucius). Taoists (followers of Lao-Tzu, but Tao was there even before Lao...Lao just wrote it up at behest of a sentry). peace is when yin and yang don't mix... so keep them away... far away from each other ... let peace prevail. Drink Alcohol. All the negative energies will dissolve and you will be left with only Positive energies. Dhur ji, On Manthara- without her, how could Ravan ever have been killed.